Follow the White Bunny: Sweet Beetle Bug Free embroidery patterns and a new winner! 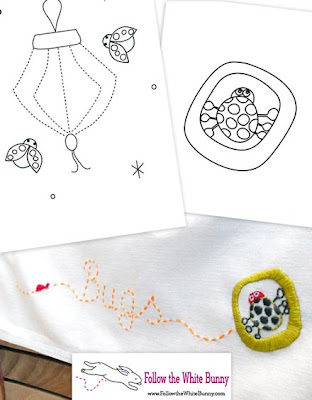 Sweet Beetle Bug Free embroidery patterns and a new winner! You may remember I stitched a couple of cute little bugs a couple of months ago based on Saffron Craig's Beetle Bug fabrics. It has gone a bit quiet after that but finally we decided to make these available as a freebie embroidery pattern for you all! Woohoo! 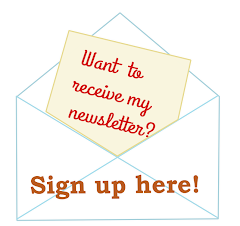 If you go here and sign up on Saffron's site you will receive an email with a link. The little bug is great for tea towels and napkins and the lantern bugs are lovely on a pillow case (in the pattern you will also find the lettering for the words 'Nite Nite Bugs'). Be sure to check out Saffron's other fabrics too. The softie panels make great quick and easy Christmas gifts for the little ones! I'm also happy to announce that I found a winner for my Baby Go! Fabric Cutter. Lisab (comment no.4) is the winner. I have already contacted her and she is very pleased with her prize. Congratulations Lisa! If you haven't already please take a look at the special offer for Follow the White Bunny Blog readers that Carina has for you: a 10% discount on her online Christmas Stitches Embroidery Class! Read all about it in the blog post below.